The fourth variation using the 319 and 318 elements I have available. This is a powder blue 318 with a cream interior from a 319. It looks great with the cream interior - no added detailing for this one. Because the 319 interior is slightly wider than the 318 version the side windows are very stiff and do not move up and down easily but they look really nice as they are, in my view. 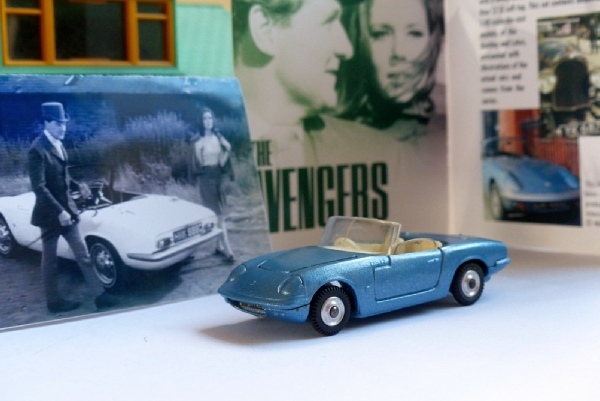 This is intended as an alternative Emma Peel Lotus, being the colour used in the colour editions of the TV series. That needs a black interior, however, not currently available but is for sale as it stands if any collector is interested as it is a fabulous version and unmarked.